Time for Vildmarksmässan once again. 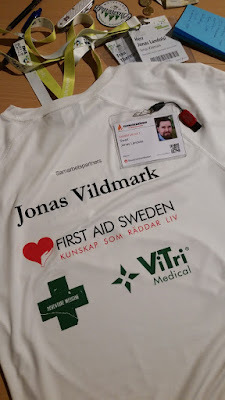 So happy that Jonas Vildmark got the opportunity also this year to share my experiences during the fair. Last year (2016) the premiere of the concept Camp Vildmark was a success. Therefore this year this training area had been extended and filled even more with interesting presentations and workshops. Some of the topics were; Hike Planning, First Aid and Drying Food. It's the inspiring gang of Swett that arrange Camp Vildmark in cooperation with Vildmarksmässan. Of course I said Yes when I this year was asked to speak about Hunting and Survival as well as give a workshop in Bushcraft Whittling. Below you'll find the different blocks I offered during the weekend at the Vildmarksmässan in Stockholm. I want to give my warmest thanks to all of you attended my speeches and workshops. Swedish hunting is getting more popular each day. Therefore I wanted to help you out if you have any thoughts about taking your license. We went trough what is expected of you when studying for your exam and how the hunting culture of Sweden looks like. 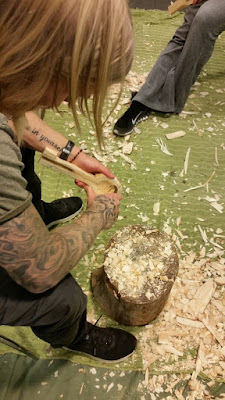 This was a workshop where I'll went through the edge tools (knife, axe and saw) and how to handle these in a safe way. The rest of the session you got the opportunity to exercise your techniques whittling your own piece of woodwork. The absolute basics of Survival is the knowledge of the mind and the body. During stress in an extreme survival situation motivation is your best friend together with the insights of what the human body can withstand. The tactical part of survival is very important for your safety in an extreme situation. The aspects of planning, signaling and navigation together with the knowledge of your own limitations are key aspects in your safety when in an uncomfortable survival situation. I'm really happy for this creative weekend. 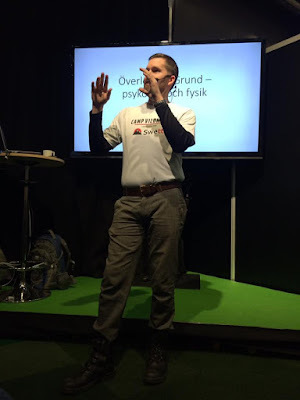 We got to meet up with a bunch of inspiring people and had so many interesting discussions about Survival, Bushcraft, Edge tools and Hunting as well as Outdoor life in general. We want to send a special thanks to the guys at Swett and Vildmarksmässan. I hope that Camp Vildmark will continue to develop so that we can keep spreading knowledge and inspiration about our amazing Nature. Thanks for listening! Please also visit Jonas Vildmark on Facebook where you can find more pics and fun stuff from this weekend's exhibition in Älvsjö Stockholm. For earlier years at the Vildmarksmässan; click HERE.